An international team of astronomers have accurately determined the radius and mass of the smallest core-burning star known until now. The observations were performed in March 2004 with the FLAMES multi-fibre spectrograph on the 8.2-m VLT Kueyen telescope at the ESO Paranal Observatory (Chile). They are part of a large programme aimed at measuring accurate radial velocities for sixty stars for which a temporary brightness "dip" has been detected during the OGLE survey. 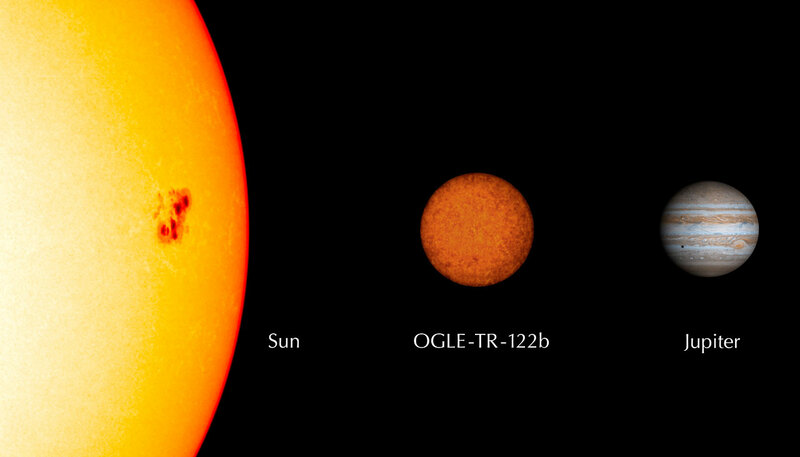 The astronomers find that the dip seen in the light curve of the star known as OGLE-TR-122 is caused by a very small stellar companion, eclipsing this solar-like star once every 7.3 days. This companion is 96 times heavier than planet Jupiter but only 16% larger. It is the first time that direct observations demonstrate that stars less massive than 1/10th of the solar mass are of nearly the same size as giant planets. This fact will obviously have to be taken into account during the current search for transiting exoplanets. In addition, the observations with the Very Large Telescope have led to the discovery of seven new eclipsing binaries, that harbour stars with masses below one-third the mass of the Sun, a real bonanza for the astronomers. When a planet happens to pass in front of its parent star (as seen from the Earth), it blocks a small fraction of the star's light from our view . These "planetary transits" are of great interest as they allow astronomers to measure in a unique way the mass and the radius of exoplanets. Several surveys are therefore underway which attempt to find these faint signatures of other worlds. 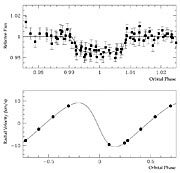 One of these programmes is the OGLE survey which was originally devised to detect microlensing events by monitoring the brightness of a very large number of stars over extended time intervals. During the past years, it has also included a search for periodic, very shallow "dips" in the brightness of stars, caused by the regular transit of small orbiting objects (small stars, brown dwarfs  or Jupiter-size planets). The OGLE team has since announced 177 "planetary transit candidates" from their survey of several hundred thousand stars in three southern sky fields, one in the direction of the Galactic Centre, another within the Carina constellation and the third within the Centaurus/Musca constellations. The nature of the transiting object can however only be established by subsequent radial-velocity observations of the parent star. The size of the velocity variations (the amplitude) is directly related to the mass of the companion object and therefore allows discrimination between stars and planets as the cause of the observed brightness "dip". This ambitious programme has so far resulted in the discovery of five new transiting exoplanets (see, e.g., eso0232 for the announcement of two of those). 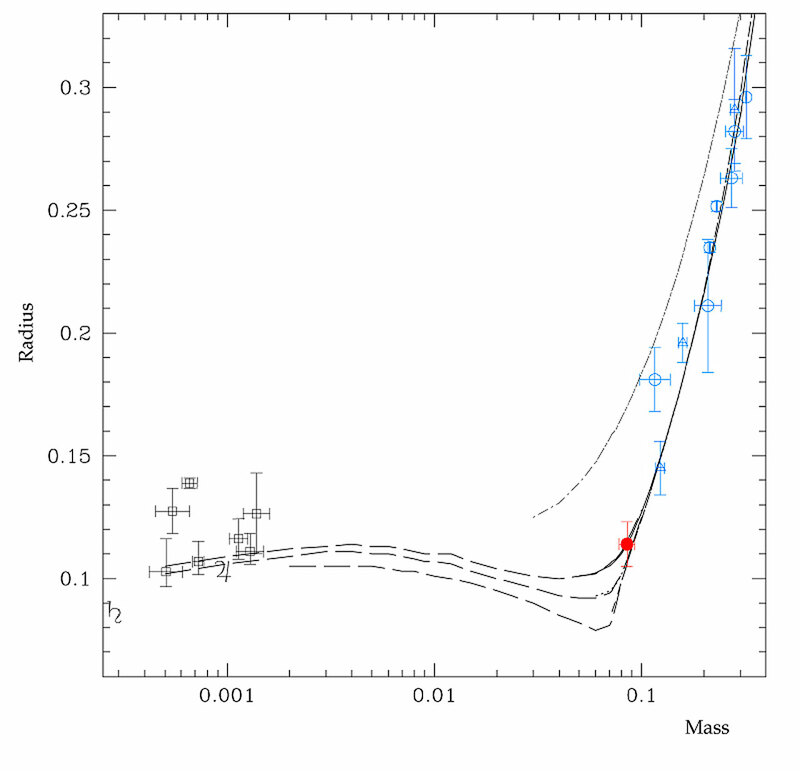 Until recently, very few observations had been made and little was known about low-mass stars. At this moment, exact values of the radii are known only for four stars with masses less than one-third of the mass of the Sun and none at all for masses below one-eighth of a solar mass. This new set of observations thus almost triples the number of low-mass stars for which precise radii and masses are known. And even better - one of these stars now turns out to be the smallest known! As François Bouchy of the Observatoire Astronomique Marseille Provence (France) explains: "Combined with the information collected by OGLE, our spectroscopic data now allow us to determine the nature of the more massive star in the system, which appears to be solar-like". "Imagine that you add 95 times its own mass to Jupiter and nevertheless end up with a star that is only slightly larger", suggests Claudio Melo from ESO and member of the team of astronomers who made the study. "The object just shrinks to make room for the additional matter, becoming more and more dense." "This result shows the existence of stars that look strikingly like planets, even from close by", emphasizes Frederic Pont of the Geneva Observatory (Switzerland). "Isn't it strange to imagine that even if we were to receive images from a future space probe approaching such an object at close range, it wouldn't be easy to discern whether it is a star or a planet?" Not less striking is the fact that exoplanets which are orbiting very close to their host star, the so-called "hot Jupiters", have radii which may be larger than the newly found star. The radius of exoplanet HD209458b, for example, is about 30% larger than that of Jupiter. It is thus substantially larger than OGLE-TR-122b! This discovery also has profound implications for the ongoing search for exoplanets. 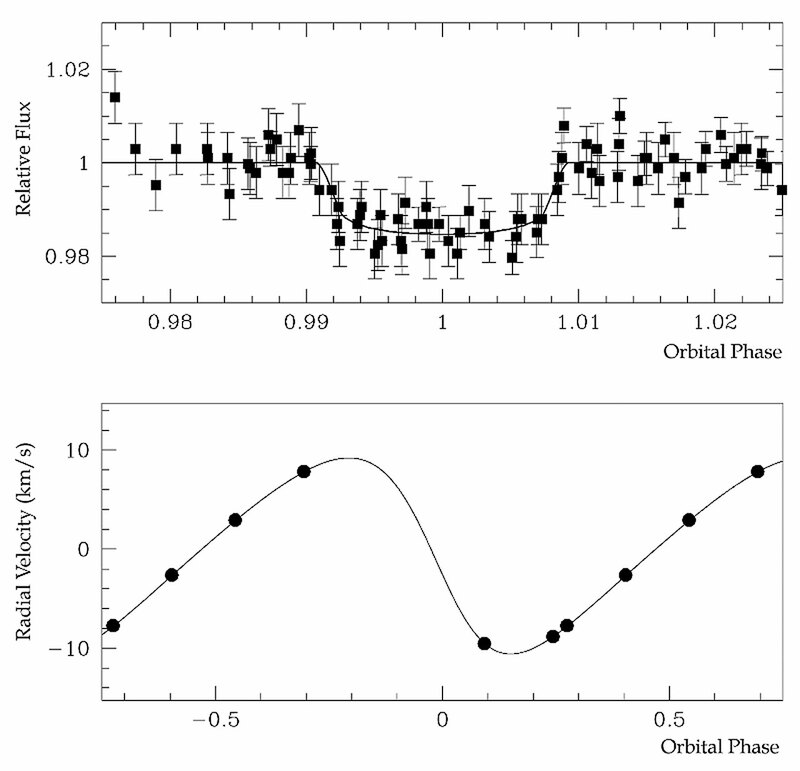 These observations clearly demonstrate that some stellar objects can produce precisely the same photometric signals (brightness changes) as transiting Jupiter-like planets . What's more, the present study has shown that such stars are not rare. Brown dwarfs, or "failed stars", are objects which are up to 75 times more massive than Jupiter. They are too small for major nuclear fusion processes to have ignited in its interior. The radius of a Jupiter-size planet is about 10 times smaller than that of a solar-type star, i.e. it covers about 1/100 of the surface of that star and hence it blocks about 1 % of the stellar light during the transit. The team consists of Frédéric Pont, Michel Mayor, Didier Queloz and Stéphane Udry of the Geneva Observatory in Switzerland, Claudio Melo of ESO-Chile, François Bouchy at Observatoire Astronomique Marseille Provence in France, and Nuno Santos of the Lisbon Astronomical Observatory, Portugal. This amounts to measuring a speed of 180 km/h. By comparison, the motion of the Sun induced by Jupiter is about 13 m/s or 47 km/h. This motion is proportional to the mass of the planet and inversely proportional to the square root of its distance from the star. For a normal star like the Sun whose matter behaves like a perfect gas, the stellar size is proportional to the mass. However, for low-mass stars, quantum effects become important and the stellar matter becomes "degenerate", resisting compression much more than does a perfect gas. For objects with a mass below 75 times the mass of Jupiter, i.e. 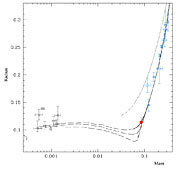 brown dwarfs, the matter is fully degenerate and their size does not depend on the mass. Note that a distant transiting object - star or planet - will always produce a brightness "dip", however bright it is itself. Before and after the transit, the recorded brightness equals the sum of the brightness of the central star and that of the orbiting object. During the transit, the recorded brightness is this sum minus the light emitted by that part of the central star that is obscured. The information contained in this press release is based on a research article to appear soon as a Letter to the Editor in the leading research journal "Astronomy & Astrophysics" ("A planet-sized transiting star around OGLE-TR-122" by F. Pont et al.). The paper is available in PDF format on the A&A website.